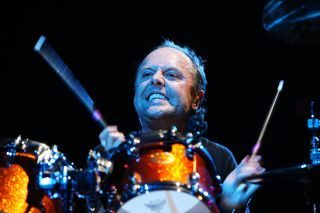 Lars Ulrich has been talking about Metallica's forthcoming movie, Metallica Through The Never. The movie centres on a'tallica roadie who is sent on a mysterious mission while the group plays an arena gig - with live footage of the band alongside the story narrative. Speaking about the movie, he said: "As a band we have an inbuilt fear of repetition or stagnation or irrelevance and we just like to throw ourselves into all this crazy s**t all the time. "Making a movie at this level has been a little overwhelming. In the musicworld, you get very used to controlling your environment and in the film world there is nothing to control… it's just like a complete clusterf**k… and there's a bizarre beauty in that." "I would love to do something. I have actually been offered the chance to both direct and produce as well as write and I've acted in a couple of films so I do what I can. Metallica is the main thing in my life and I'm not going to turn my back on that." This guitar player should definitely change instruments. Might we recommend something you can hit, like drums? We tracked the KISS legend down to his studio and found him asleep in his bass drum. He wouldn't say much, though. This is what happens if you drink too much before a gig. You might still be able to keep time, but can you stay sat on your drum stool? We were back at Rhythm's photography HQ this week shooting gear for forthcoming issues. This month we welcomed back an old friend - the Pearl Export. After several years away this much-loved line has returned, keep your eyes peeled for a review coming shortly. We also got up close with new gear from Zildjian, Paiste, Flynn Drums, Natal and more.